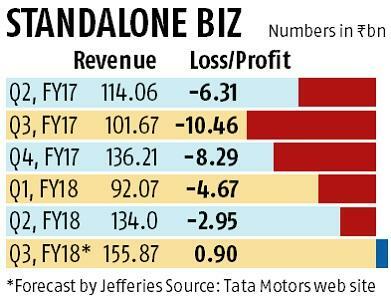 The third quarter of this financial year could be a different ride for the standalone business of Tata Motors, the country’s biggest automaker by revenue. The company’s standalone business, which gets over two-thirds of revenue from commercial vehicles, has been in the red for five consecutive quarters. Analysts, however, expect the company to report a small profit when it announces its performance for the October-December quarter in the first week of February. “We expect Tata Motors’ standalone to turn profitable in Q3 after several quarters of losses, helped by strong volume growth across all key segments (medium and heavy commercial vehicles for goods, light commercial vehicles, and passenger vehicles,” global investment banking firm Jefferies said in a report on Monday. The firm expects Tata Motors to report a standalone profit of Rs 902 million in the said quarter against a loss of Rs 0.46 billion in the corresponding period of FY17. Analysts attribute this trend reversal primarily to the sharp surge in volume seen during the quarter. The company’s passenger vehicle business has clocked high double-digit growth of 20 per cent to 47,812 units. But the bigger business of commercial vehicles and the mainstay of the standalone business performed even better. The M&HCV (trucks) segment clocked a growth rate of 55 per cent in domestic sales to 45,895 units in the quarter, according to Siam data. The LCV segment (for goods) has also expanded by 42 per cent to 51,094 units in the domestic market. Commercial vehicles account for 80 per cent of the revenues of the company’s standalone business. Bharat Gianani, an analyst with Sharekhan, said the overall domestic volume growth for the company’s sales was 30 per cent in the quarter but the revenue was expected to expand at close to 60 per cent owing to a sharp increase in the volume of heavy trucks. “This topline growth gives a high operating leverage. We expect the standalone business to break-even during the October-December quarter with a small profit of Rs 10 million. However, the FY18 standalone business is expected to be in loss and looks well placed to be profitable in the next financial year,” said Gianani. The cumulative loss in the standalone business since July 2016 is more than Rs 32 billion, driving the company to initiate cost reduction measures, beside focusing on gaining back the lost market share in the commercial vehicles business. Guenter Butschek, chief executive officer and managing director of Tata Motors, said in September last year that the company was in a volume business, and volume growth would determine bottom line improvement. The company had indicated last year that it would achieve an improvement of Rs 1,500 crore in bottom line from volume growth and reduction in costs. No time-frame was specified for this reduction. 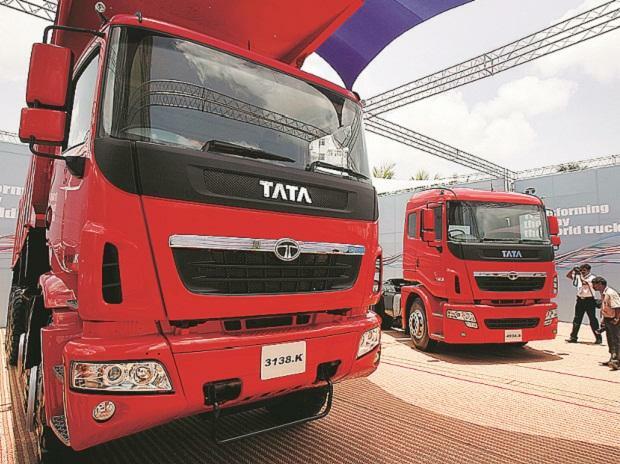 Tata Motors also said it would review its manufacturing footprint both for commercial and passenger vehicles to look at developing greater synergies between the plants.